Long, long ago (before I even met Tom! ), I was lucky enough to work with my friend, Gloria. 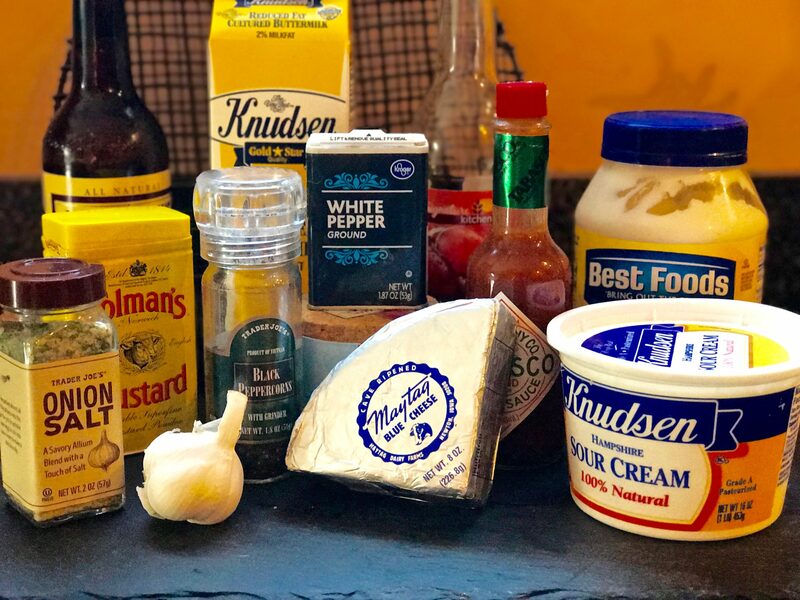 On Fridays, Gloria and I would lunch at a restaurant in Long Beach called Simon & Seaforts, and we would almost always start with a salad with this rich and creamy Maytag Blue Cheese Dressing. Although Simon & Seaforts no longer exists (at least not in Long Beach), I have the recipe card from the restaurant, and while the ingredient list is long, it is well worth the effort. Simon & Seafort’s served it over romaine greens with toasted slivered almonds, but it is equally as scrumptious on an old-school wedge salad topped with pancetta and tomatoes. When I sent Tom to the store to pick up the ingredients for this dressing, I was dismayed to learn that Maytag had been voluntarily pulled from the shelves for over a year due to a potential listeria concern. In the interim, the Maytag Dairy Farm took the opportunity to renovate their facilities to meet new regulatory requirements mandated by the federal Food Safety Modernization Act. I also read that they continued to operate without laying off any of their 100 employees (good for them!). The website stated that they planned to resume shipping of Maytag in September 2017, so I put myself on their mailing list to receive the cheese as soon as it was available. Maytag is not a strong tasting blue cheese; it is mild, sweet, creamy and delicious. It’s made in the United States (on the Maytag Dairy Farm in Iowa) from homogenized cow’s milk rather than sheep’s milk. 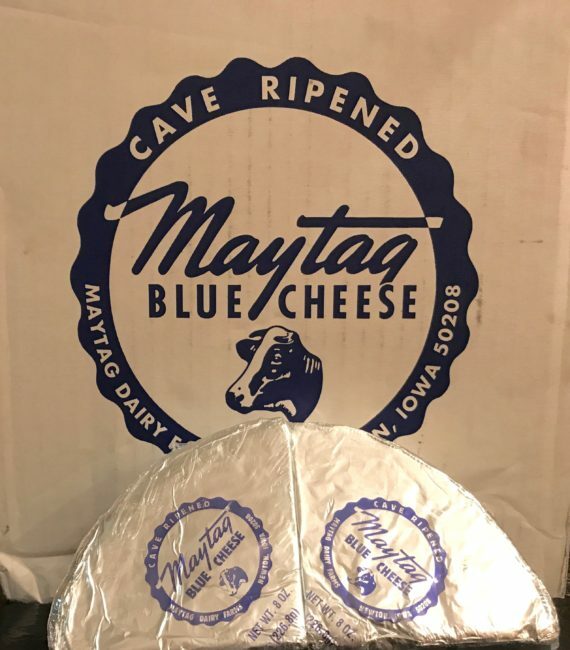 If you love blue cheese and haven’t had a chance to try Maytag, we highly recommend this cheese. “In 1919 E.H. Maytag, the son of Maytag Appliance company founder F.L. Maytag, purchased a single Holstein cow to provide fresh, clean milk to his children. “E.H. quickly developed a passion and determination to breed champion Holstein-Friesian cows that could supply milk to the community while also winning blue ribbon upon blue ribbon at livestock shows across the United States. At its peak in the 1930’s, E.H. likely had the finest herd of Holstein cows in America and produced offspring that were prized by important buyers from around the world, some of whom made the trek to Newton, Iowa to see his famous herd. The amount of pancetta (Italian bacon) is up to you. 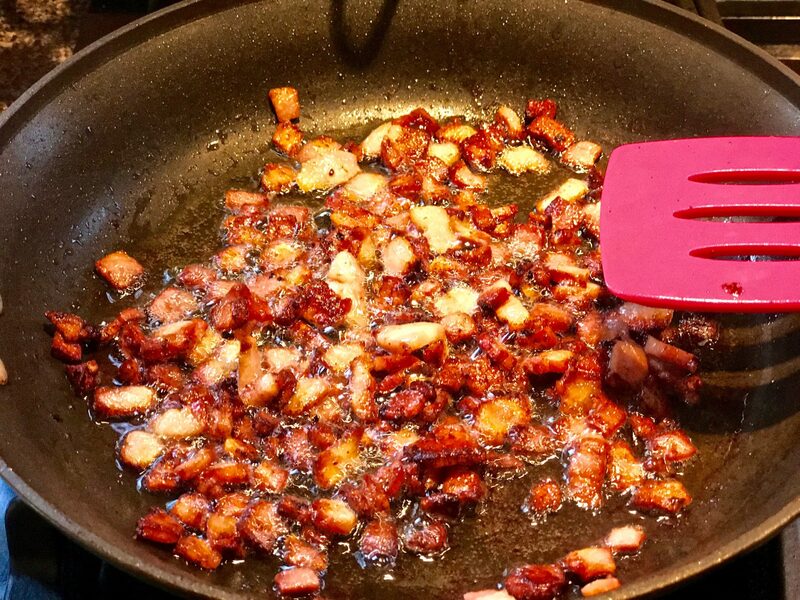 Tom’s motto is “To make dishes betta…You can never have too much pancetta!” We used four pieces sliced 1/4 inch thick, which I diced and sautéed. 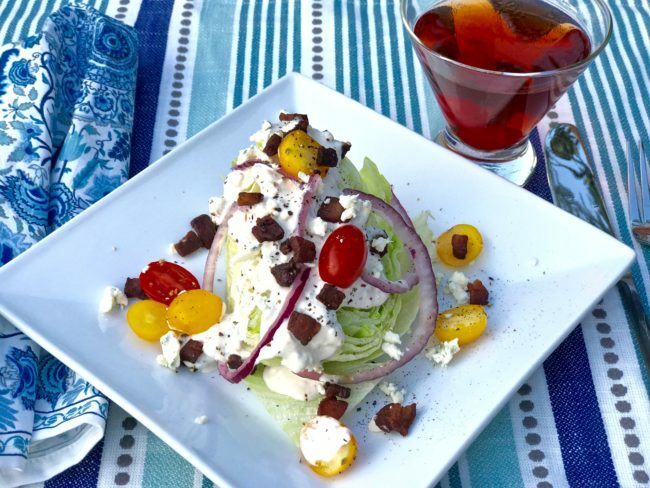 This salad is substantial enough to serve as the main course, but it is especially delicious with a BBQ steak and a Manhattan. 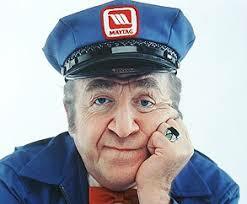 Welcome back, Maytag Dairy…the “Loneliest Guy in Town” would have loved it! In a pint jar (or larger), dissolve the spices into the vinegar, Worcestershire, and Tabasco. Combine with sour cream and mayonnaise and buttermilk to thin. Stir in the crumbled blue cheese and let sit overnight. Preheat oven to 400°F. Arrange pancetta slices on rimmed baking sheet, spacing apart. Bake until golden brown and crisp, about 20 minutes (do not turn). Or use the method I prefer, dice the pancetta and sauté until crispy. Drain on paper towels. Cool. 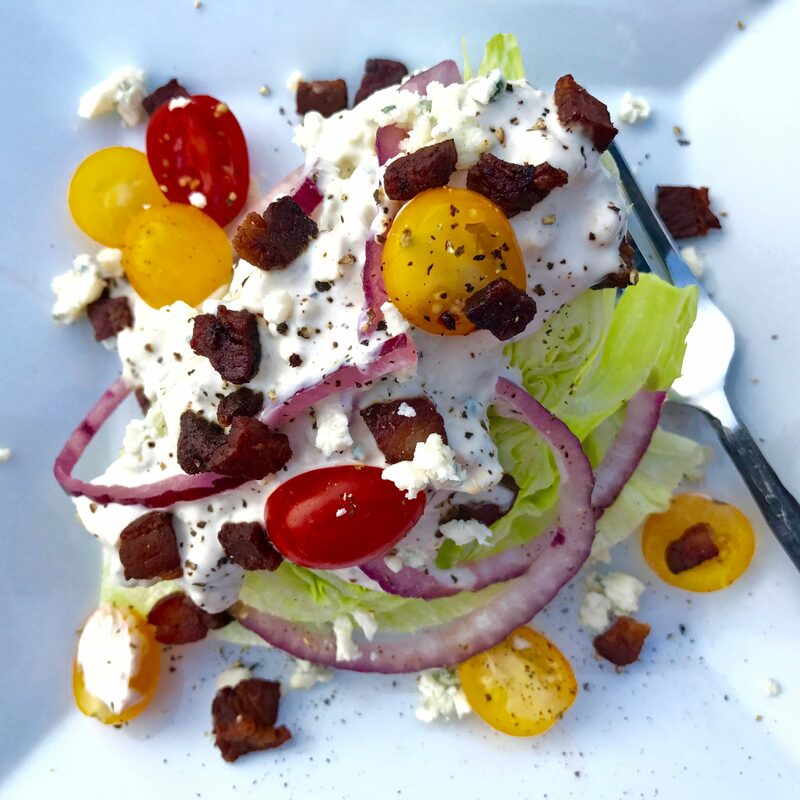 To assemble the salad, put the wedges on individual plates, top with salad dressing to taste, followed by the tomatoes, pancetta and a couple of thin slices of the red onion. Sprinkle 1 T. of the crumbled blue cheese over each serving. Coarse ground black pepper to taste. Makes 4 salads plus some leftover dressing.